Today in Gosport’s Past:- on 12 October 1817, HMS “Trincomalee” was launched in the Wadia Shipyards, Bombay, India. 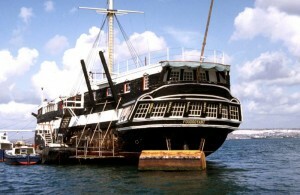 After completion, she sailed to Portsmouth, arriving on 30 April 1819. 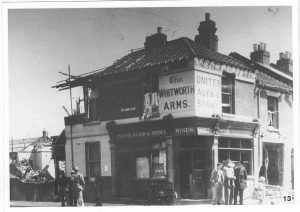 £2,400 was spent on fitting out, then the ship was placed ‘in ordinary’, meaning the masts were removed, and the deck was roofed over until such time as she was required. recoppered below the waterline to prevent damage; this was repeared in 1845, at which time some alterations were made to the stern, and the number of guns was reduced, although these were more powerful. On 21 September 1847, HMS “Trincomalee” was finally commissioned for the first time since her launching 30 years previous. After a fairly colourful naval career of 10 years, “Trincomalee” returned to Chatham on 5 September 1857, and was soon demasted, and once again placed ‘in ordinary’. In January 1861, the ship was towed to Sunderland to act as a tender for the drill ship HMS “Castor”, seeing use for the first time as a training ship. 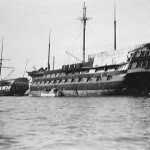 In 1862, she was moved to West Hartlepool, and used there as a training ship until January 1873, but had been re-gunned and roofed over in April 1870. 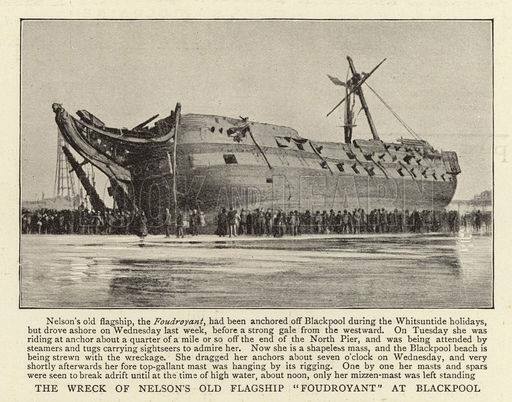 TS (formerly HMS) “Foudroyant” wrecked on the beach at Blackpool in June 1897. Portsmouth. This is where fate takes a hand, and Gosport starts to feature vaguely in the ship’s history. Since 1862, HMS “Foudroyant” (launched 1798) had been in use as a gunnery training ship at Devonport (Plymouth), and was sold for scrap to the same J Read in Portsmouth in January 1892, thence to a German shipbreakers. 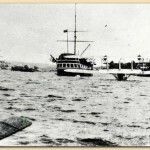 Due to a public fuss, Wheatley Cobb immediately purchased “Foudroyant” for use as a training ship again. To offset the £20,000 cost of refitting etc, the ship was exhibited at a number of British seaside resorts, and on 16 June 1897, at Blackpool, bad weather proceeded to wreck the ship, which ended up on Blackpool beach, after first damaging the North Pier. 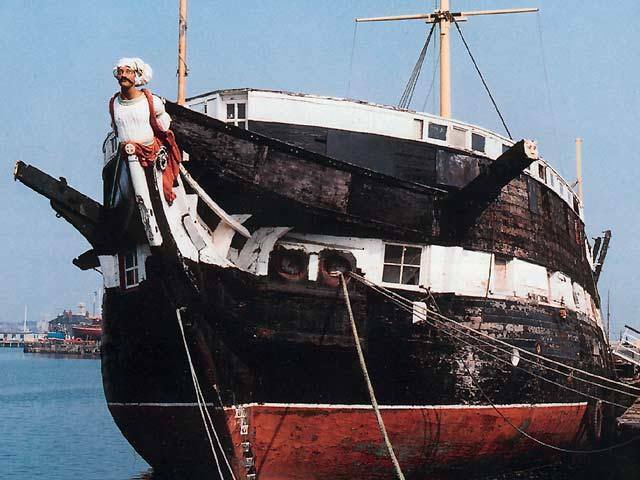 It just so happens that “Trincomalee” was still in the same scrapyard, and Wheatley Cobb jumped at the chance to replace “Foudroyant”, and rescued “Trincomalee”, which was taken to Cowes, fitted with a new poop deck, and moved to Falmouth in 1902, and repainted. 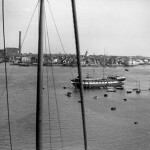 In 1903 she was renamed TS “Foudroyant” after the training ship she had replaced, and remained in the role at Falmouth until 1927, when she was moved to Milford Haven. 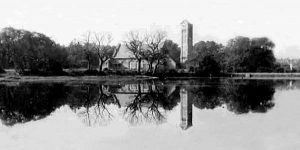 In 1932, Wheatley Cobb died, and his widow donated the ship to.the Society for Nautical Research, who moved both TS “Foudroyant” and HMS/TS “Implacable” to Gosport in 1932. The two ships were moored stem to stern near Hardway(as far as I can tell) as training ships, and were used as stores during the early years of WW2; both were recommissioned in 1943 as a single unit – HMS “Foudroyant”. 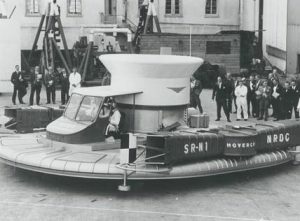 After the war, both resumed their training function, but in December 1949, despite a public outcry, “Implacable” was towed out to sea near Ventnor on 2 December 1949, and blown up. “Implacable” was Britain’s oldest floating warship at the time, having been captured from the French a week after the battle of Trafalgar. TS “Foudroyant” continued as a training ship off Haslar, then off Rat Island, until 1987, when she was transported by ship to Hartlepool, where full restoration begain in 1990, and renamed HMS “Trincomalee” in 1992. 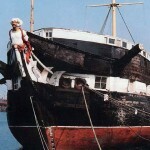 She is still afloat (the second oldest ship afloat in the world), although rather a prisoner, considered far too valuable to be exposed to sea conditions. 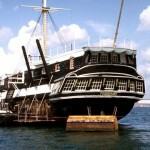 Only the USS “Constitution” is older and still floats, and “Trincomalee” looks splendid nowadays, just not in Gosport…. Credits to original photographers. 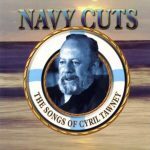 ALSO Today in Gosport’s Past:- on 12 October 1930, folk singer Cyril Tawney was born in Gosport. As a child, he attended Newtown junior school, and joined the Royal Navy when he was 16, remaining in the service until 1959, with over three years of this time being spent as a submariner. During his time in the navy he developed a keen interest in traditional English folk songs, and began singing and playing the guitar. 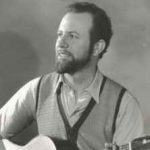 He became a quite prolific songwriter, with many of his songs having connections with the navy, or events experienced by sailors such as himself. In 1957 he performed on Alan Lomax’s radio show on Christmas Day; this was favourably recieved, and was invited to perform again, this time on a TV show the following Easter Sunday. This was also a success, and he was soon offered a weekly television spot, and a TV show entitled “Watch Aboard”. This was enough to convince Cyril that his future lay not in the navy, but in folk music, and he left the Royal Navy early in 1959. He soon had his own weekly radio show entitled “Folkspin”, and began to research traditional songs of the South-West and 20th-century Royal Navy songs. He opened the first folk club in Plymouth, where he met his wife-to-be, Rosemary. and had a great deal to do with the popularity of folk music in the West Country. 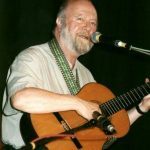 His career as a professional folk singer lasted an unchallenged 44 years, and he was still occasionally musically active until a year before his death on 21 April 2005 in hospital in Exeter, although he and his wife had lived in Leeds for many years. 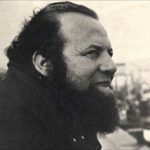 He appeared on a good many recordings with other artists, as well as a dozen or more of his own albums – some on vinyl, some on cassette, and some on CD; around a dozen of these solo recordings have been re-released as CDs since his death, as have a number of his collaborative works, which include being part of the wondrously bizarre Les Barker’s Mrs Ackroyd’s Band; Les Barker is a poet of strange dimensions, and has appeared in Gosport on a number of occasions – if you’ve ever experienced his act, you’ll know what I mean! Some of Cyril’s songs have been recorded by other musicians: ‘Grey Funnel Line’ was recorded by Emmylou Harris, Dolores Keane & Mary Black on the splendid BBC production ‘Bringing it All Back Home’ double album, and his ‘Sally Free and Easy’ has been recorded by Bob Dylan as ‘All Right Mama/Sally Free and Easy’.